Asgamoth was an ancient City-State, located on the shores of the Sea of Ralas. In the year 884/3, the city was destroyed during the Great Rift. In the Third Age, Asgamoth was one of the earliest Ralani City-States, which grew wealthy via trade with both the Elven city of Selunë and the Dwarven nation of Khûrzhad. Eventually, Asgamoth became the wealthiest and most powerful human city of the late Third Age. Sadly, the pride and arrogance of Asgamoth matched its wealth. The city's religious reverence was a crucial part of its cultural identity. Asgamoth contained many fabulous temples, including shrines to all four elemental Gods: Gorash, Ixion, Lehr, and Myrival. The people of Asgamoth also believed stongly in the afterlife. To aid them in the great beyond, the ancient kings of Asgamoth were buried high above the city, in the peaks of the aptly-named Cairn Mountains, their tombs filled with priceless treasures. Over the centuries, however, all the royal tombs were plundered. Today, there are precious few artifacts of the city left in existence. Legend has it, the city was destroyed by Lehr; the God of Stone, who became jealous of Asgamoth's growing allegiance to Myrival; Goddess of the sea. Today, no one really knows for sure. Whatever the true cause, the city was completely destroyed in the year 884/3, during the Great Rift; a tremendous earthquake that literally caused the entire region to slip beneath the waves of the Sea of Ralas forever. When the city of Asgamoth was consumed, its magnificent temple to the Sea-Goddess Myrival, located within its walls was lost. According to legend, Inside this great temple was the Trident of Myrival; a fabulous magical artifact. With the destruction of Asgamoth in the Great Rift, an entire section of land that connected present day Rennsfar to Serathyr fell beneath the waves as well, permanently separating the island of Renthara from the mainland of Corwyn and creating the Iron Sea. 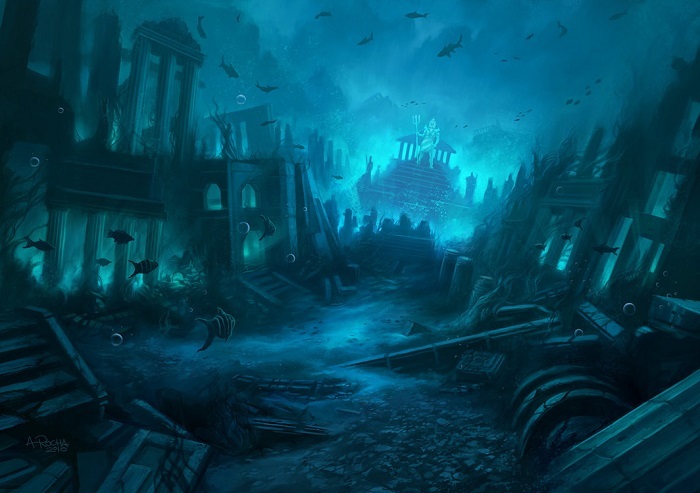 Even today, there are rumors that the city of Asgamoth lies intact; somewhere deep beneath the ocean surface. Many Ralani men and women firmly beluve Asgamoth will someday rise back up to claim its place among the nations of Corwyn.